Dental emergencies are common throughout America, with 22% of the population having experienced some degree of orofacial pain in the preceding six months, as reported by American Family Physician. Despite the dental community’s commitment to preventative dentistry as well as patient education, individuals continue to question what constitutes a true dental emergency. Besides keeping your dentist’s contact information on hand at all times, it’s important to learn about specific scenarios in which it is important to seek emergency dental care. When it comes to dental emergencies, many envision a dramatic scenario in which they are in excruciating pain. This is simply not the case, at least not always. In reality, a toothache can be considered an emergency dental concern, depending on how long the pain has lasted and how severe it is. Another example of a dental trauma that doesn’t always elicit pain is a chipped or broken tooth, as well as a lost dental filling or crown. Yet, on the contrary, a knocked out tooth is a different story, as pain can be sudden and severe. In this case, time is of the essence, as the hope of saving the tooth decreases after the first 30 minutes. Considering the differences between dental emergencies, it’s important to remember that the absence of pain does not imply that there’s not trouble ahead. 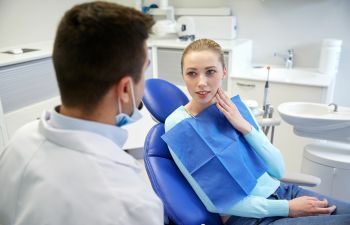 Without question, dental emergencies bring a heightened level of anxiety, as no one considers the odds of suffering a dental mishap or trauma. Yet, when this happens, Dr. Kaur and Dr. Sinada welcome your call at Alora Dentistry, where you’ll experience compassionate and rewarding emergency dental care that will put you at ease.